Leavenworth’s history does not begin with the alpine tradition it knows today, but with the proud heritage of the Yakima, Chinook and Wenatchi tribes. The Native American tribes lived by hunting the land for deer and elk, as well as fishing Icicle Creek for salmon. Surrounded by some of the most beautiful and bountiful lands in North America, the three tribes co-existed from Lake Wenatchee to the Icicle and beyond. The area was eventually settled by pioneers in search of gold, furs and fertile farmland. Stakes were claimed, land was tracked, and the Leavenworth area was soon bustling with settlers. By 1890, the original town was built on the Icicle Flats. But it wasn't until the end of the century when the town began to blossom with the arrival of the rail line. The Great Northern Railway Company’s tracks through Leavenworth brought with them opportunities for work, commerce and a new economy. A sawmill and a healthy logging industry eventually fell apart, however, when the Great Northern Railway Company pulled out of Leavenworth. The re-routing of the railroad and the subsequent closure of the sawmill sadly converted the town from a bustling, thriving hub of commerce into a hollow, empty community. For more than thirty years, Leavenworth lived on the brink of extinction. But in the early 1960’s, everything changed. In a last-chance effort to turn their precarious situation around, the leaders of the community decided to change Leavenworth’s appearance, hoping to bring tourism into the area. Using the beautiful backdrop of the surrounding Alpine hills to their advantage, the town agreed to remodel their hamlet in the form of a Bavarian village. Hoping to create more than a mere face-lift, the entire community rallied to create the illusion of Bavaria in the middle of Washington state. Besides the complete renovation of the downtown area, community members worked to begin a series of festivals. 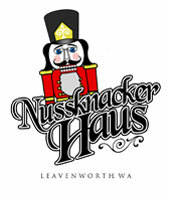 The Autumn Leaf Festival, Maifest and the extremely popular Christmas Lighting Ceremony were the first of many attractions Leavenworth offered to passers-by. It worked. 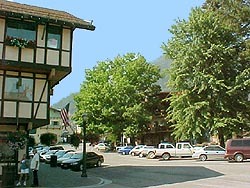 Since the change to a Bavarian motif, Leavenworth has become a pillar of the tourism industry in the Pacific Northwest. Today, more than a million tourists come to Leavenworth each year, each visitor finding their own individual love affair with the community. The story is a landmark case of the human spirit: Not only did the people of Leavenworth survive their most critical hour, but they endured. Please visit the Chamber of Commerce website Leavenworth.org for a complete list and description of all events and activities in Leavenworth, or call (509) 548-5807.